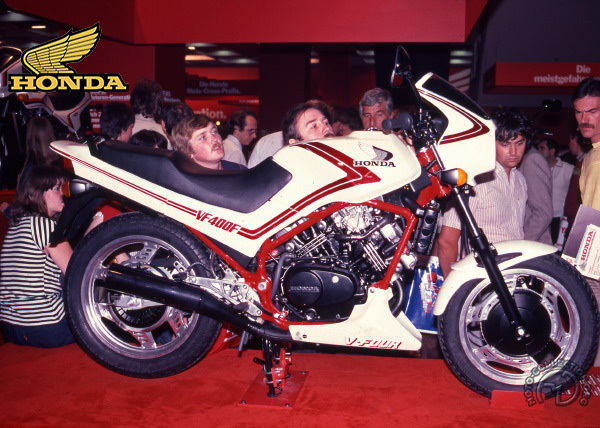 Along with its larger sibling, the 750 – launched at the same time – the VF400F of 1983 was part of the second generation of V4 Hondas. After marking time with the original VFS and VFC, the V4 achieved full maturity thanks to this advanced VF/F series. No 400cc machine had ever benefited so greatly from technical refinement. The water-cooled dohc 16-valve V4 was from the start the most powerful in its class, developing 55 hp at 11,500 rpm. Strongly influenced by the contemporary 500cc Grand Prix machines, the frame had a forward engine position, 16 inch front wheel and Pro Link rear suspension. The bike's design forced the rider to sit forward. It was a fine collection of advanced technology – which accounted for a price over 20 percent higher than its rivals. Happily, the VF400F was not just for show: it could display the technical correctness of the ideas it incorporated on the highway. If its low-speed performance was a little weak, the engine was refreshingly lively, and revved as smoothly as a turbine right up to the red line. Its cycle components were outstandingly effective. Surprisingly easy to handle at low speeds, the little bike cornered like a dream and was stable as an arrow in a straight line. Already a success at the outset, the VF400F evolved into a 500cc machine of outstanding maturity thanks to the larger engine with improved mid-range performance. What its little V4 power unit tacked in torque, the VF400F more than made up for with its stunning race-bred handling.